In order to enjoy efficient businesses communications, one of the first things companies must do is ensure access to a reliable, feature-rich phone system. Most of the older, proprietary telephone systems are, understandably, ill-equipped to handle today’s modern enterprises. Because of this, many businesses are choosing to switch from their traditional phones to more advanced and feature-rich Voice over Internet Protocol (VoIP) phones. PanTerra Networks, a leading provider of unified cloud services and solutions for mid-market enterprises, is bringing more options to businesses who are seeking modern IP phone systems to improve their communications and collaboration. The company recently announced a distribution agreement with Yealink, a leading global provider of unified communication (UC) terminal solutions, in order to make business-class phones accessible to their customer base. Yealink is one of the innovators and well-known names in business telephony. Their comprehensive product portfolio includes desk IP phones, video conferencing systems, conference phones, wireless DECT phones, and accessories. PanTerra’s latest partnership with Yealink enables them to sell and distribute Yealink’s range of SIP desk phones, T2 and T4 series, and cordless DECT phones, W52P and W56P. Stone Lu, Yealink Vice President, expressed his delight over their new partnership with PanTerra. "We are very glad to partner with PanTerra," said Lu. "The PanTerra and Yealink solutions offer advanced, enhanced joint benefits for customers in the US. The cooperation with PanTerra also helps us further expand our presence in the region. We look forward to advancing our product line and distribution further with PanTerra." T21P E2 – An entry-level HD phone, Yealink’s new SIP-T21P E2 is a powerful and cost-effective IP solution that offers a smooth user experience for businesses. It features a large 132x64-pixel graphical LCD, dual 10/100 Mbps network ports with integrated PoE to extend network use, and offers support for up to two SIP accounts. T23G - An enterprise phone that supports up to 3 lines, T23G also features a 132x64-pixel graphical LCD with backlight, dual-port Gigabit Ethernet, Power over Ethernet (PoE), and Yealink’s HD technology for richer, clearer, life-like voice communications. T40P – For businesses looking for an advanced feature-rich phone solution, the T40P is an excellent option. SIP-T40P boasts a slew of productivity-enhancing features such as PoE support, HD sound quality, and a rich visual experience. T41S – T41S is a feature-rich business phone that offers superior communications and a host of extended functionalities. A six-line phone that boasts a faster, more responsive interface, T41S features the Yealink Optima HD Voice technology and wideband codec of Opus for superb, crystal-clear communications. It also includes Bluetooth, Wi-Fi, and USB recording features. T42S – T42S is a twelve-line IP phone built with Gigabit Ethernet technology for rapid call handling. In addition to standard IP PBX features (including busy lamp field, hot desking, and call recording), this device is also equipped with Bluetooth, Wi-Fi, and USB recording features. T46S – T46S is ideal for busy executives and professionals. 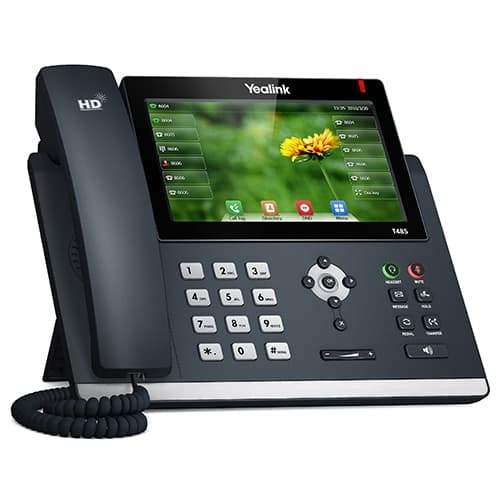 It features a 4.3" 480 x 272-pixel color display with backlight, supports up to 16 VoIP accounts, and includes over 40 phone and IP PBX features. T48S – This is an executive touch-Screen phone with 16 lines. It boasts a 7" 800 x 480-pixel color touch screen with backlight, PoE, as well as Yealink’s Optima HD Voice technology and wideband codec of Opus for superior audio quality. DECT W52P – This is a cost-efficient cordless phone system designed for small businesses and small office/home office (SoHo) workers. Users can benefit from the freedom of wireless communications as well as the lifelike voice communications of Yealink HD technology and professional VoIP features, such as intercom, three-way conferencing, call transfer, call forward, and more. DECT W56P – Ideal for busy on-the-go workers in various industries such as warehousing, catering and retailing. Its 2.4-inch color screen and excellent battery life help road warriors stay connected always. According to Chang, these phones will be available through PanTerra’s distribution channels, effective immediately. For more information, please visit PanTerra Networks or Yealink. PanTerra Networks provides business-class unified cloud services to mid-market enterprises. Dedicated to helping enterprises change how they conduct businesses, PanTerra offers a highly secure, ultra-reliable, future-proof unified cloud service that seamlessly provides multi-media communications, collaborations, contact center, file sync & share and business analytics capabilities to businesses, the WorldSmart solution. WorldSmart services include PanTerra’s CloudUC unified communication service and SmartBox, an enterprise file share and sync solution. PanTerra is headquartered in Santa Clara, CA. Yealink is a leading global provider of unified communication (UC) terminal solutions. They aim to help businesses of all sizes enjoy easy collaboration and upgrade their UC experience. Customers from more than 100 countries choose Yealink via its global sales and service network to provide outstanding communications service through their range of video conferencing systems, conference phones, desk IP phones, wireless DECT phones, and accessories.